Spoons is a unique game that blends fast-paced card matching with the age-old skill of bluffing. Played with an ordinary pack of playing cards and strangely some standard kitchen spoons, the main objective for each player is to grab a spoon. Spoons can be an exciting and extremely fun and hilarious game to play, not only due to the hilarity of its structure and rules, but also due to the simplistic nature of its gameplay, which makes it appealing to players who struggle at more tactical-based card games. Spoons is played across multiple rounds, and each player has to be focused on collecting the spoons, placed centrally between the playing group. Players collect a spoon when they have a four-of-a-kind, which initiates a rush to grab the remaining spoons for the remaining players. No one player can have more than one spoon, and due to its musical chairs-type nature, the number of spoons is also one less than the total number of players. Spoons generally needs to be played with three players at the very least, and an ordinary pack of 52 playing cards, although two packs can be used for a more streamlined experience. The total number of spoons placed in the middle must not exceed the number of players. That said, spoons don’t need to be used — you can use any small object, really – although part of the fun and hilarity of the game is the fact you’re blending a standard card game with a kitchen utensil. It just wouldn’t be as enjoyable with a pencil. Place the spoon in the middle of the circle, with the handles pointing outward so that players may easily grab one. Extreme Spoons: A game like this can’t exist without an “extreme” version. Rather than having the spoons placed in the middle, they’re stored in inconvenient locations around the playing room. Joker Spoons: Same rules as standard (or Extreme) Spoons, except Jokes are added to the deck and substitute for all other cards as a Wild. At the start of each game, the “dealer” (a role that alternates with each round) will deal four cards to each player. If a player has four-of-a-kind, they must grab a spoon. Then, all remaining players must rush to grab the remaining spoons. Depending on the rules you set out, the losing player can either be eliminated from the game, or perhaps lose a point. There’s no strict rule in place in that regard, but generally the losing player has to be punished in some regard. If a player doesn’t have a four-of-a-kind, they can discard a card and request a replacement card from the dealer. Interestingly, players can pick a card from the discard pile, but only once they have discarded another card. A player can request a card from the dealer without discarding a card, but no one player can have more than five cards, or less than four cards at any one time. Once the original pile is finished and no one has landed a four-of-a-kind in their hand, the dealer must use the remaining discarded pile to continue the game. 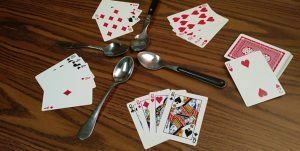 There are probably countless ways you could score Spoons, although there are two general ways to play. The most common is that the game is played until all but one player is eliminated, who is crowned the winner. With each eliminated player, a spoon is removed from the pile to ensure there is always only one more spoon than the number of players. Another common scoring method is a spelling system, in which the losing player from a round “earns” a letter from the word “Spoon”: if they lose a round, they get the letter “S”, and then “P”, and so on. Players are eliminated from the game once they spell “Spoon” in full. As with the other system, the number of spoons is reduced to ensure there is only one more than the number of players at any one time. The winner is crowned once all but one player spells the word “Spoon”. This version obviously takes longer than the former, although it tends to be a little more enjoyable due to the length and unpredictability of a match: someone could lose four games in a row, but then still win if everyone else spells the word in full before the net the final “n” letter. There are number of ways to play — and be good at — Spoons, and they mostly involve utilising standard card game tactics such as bluffing and playing with an “alliance”. Bluffing is encouraged due to the nature of the game, as you could discard a card, pick an additional card, and have to wait until your next turn to grab a spoon. If you can hold off on the excitement on your face, you can trick everyone into a rush for the spoons, and potentially knock out an arch rival. Playing vigilantly is important, because there’s no rule governing how quickly or loudly a player has to be when they grab a spoon. They aren’t obliged to tell the other players, so you need to keep an eye on your cards and the number of spoons and players at all times. You don’t want to be the last one to realise a spoon has been taken, because by that point you’ll realise there are no spoons left. Playing with an alliance may seem a little too series for such a casual game, but it can work in your favour if you feel like ganging up on a particularly good and fast player. Team up with someone, but be wary of their own agenda. While you may want to get in with them down to the final two, they may very well turn on you for your own benefit. Why wouldn’t they? They want to win, don’t they? Is it legal to play real money games on the internet? Is Keno a suckers game? Is video poker considered a card game? How Do You Play Pot Limit Omaha (PLO) Poker?